The University’s excellent student outcomes say a lot about the high quality of a DMU education. The curriculum will prepare you for a lifetime of success, with its extensive training in osteopathic manual medicine, physical diagnoses and preventive and evidence-based medicine. Medical humanities and bioethics are integrated throughout the curriculum, and a wide array of electives allow students to explore different topics. The four years of study are divided into pre-clinical and clinical phases. The first year focuses on fundamental scientific principles that form the foundation of medicine. The second year builds on that with an integrated organ system approach encompassing basic and clinical sciences. Students also have extensive simulated patient encounters and laboratory experiences that let them gain and improve clinical skills. The curriculum combines lectures, case-based and small-group discussions and laboratory exercises. Students also have learning experiences in hospitals, clinics, and community service agencies. In the third and fourth years, students are fully immersed in clinical training in rotations at hospitals and clinics. They build on the knowledge and skills gained in the first two years in diverse practice settings, from metropolitan medical centers and rural hospitals to ambulatory clinics. Students have access to board examination review resources during their first, second and third years. At the end of their second year, they take a board preparation exam. In the summer after their third year, students return to campus for a weeklong comprehensive clinical assessment that allows them to evaluate their current clinical knowledge and skills, identify gaps and remediate any deficiencies. 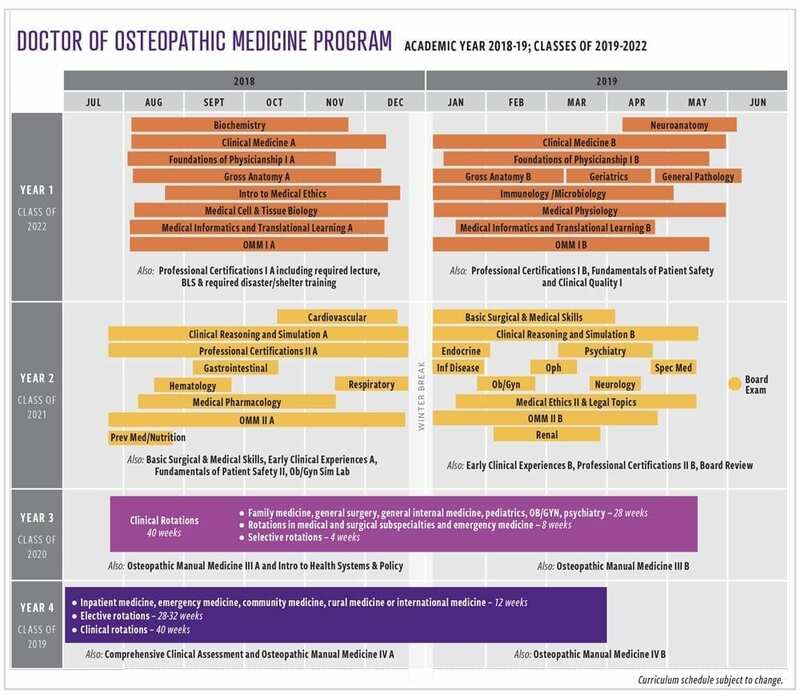 The course includes a computer-based standardized board-like exam, standardized and simulated patient encounters, an osteopathic manual medicine patient case, an OMM written exam and a review of the residency match process.